This is one of the earliest piano concertos we have talked about, certainly the earliest in our little string of four or five here. Actually the second of Chopin’s two complete piano concerto to be written, it was published first, thus getting the no. 1. 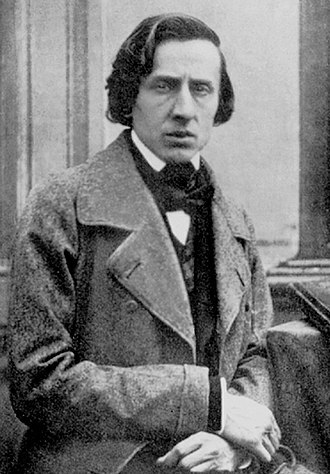 Today (10/17) also marked the 165th anniversary of Chopin’s death. While certainly famous, and certainly beautiful, this piece has its criticisms, one being the extremely background role of the orchestra, again, in contrast with something like the Prokofiev from last week. The orchestra is kind of a platter on which the piano is served; they ARE the stage. This can make for a boring piece to perform for an orchestra, but I suppose can also be boring for some listeners. I won’t get into the actual details of this piece; I don’t feel like a play-by-play. I could wait an extra day (now actually two) to post the results, but I will try to keep my comments on the actual performance brief in the event that I decide to review that evening as a whole. In my exploration of classical music, I gravitated to Chopin. Again, my interest in classical music was, at first, related strictly to the piano repertoire, and I felt Chopin was a great place to start; he also wrote precious little for the orchestra in relation to his solo output, and nothing strictly for the orchestra. Solo piano music made sense for me, so I didn’t think much of it. The time came, though, when I started to wonder about symphonies, the real tour de force, the pinnacle of form in classical music, and it was very obvious here that Chopin offered precious little, in fact, as stated, none. He had written large(r)-scale piano works like his three piano sonatas, aside from sets of 24 preludes and etudes, which could be considered individual large works (more so the preludes to me than the etudes because of the overall structure, but that’s just opinion), but these two piano concertos of his were the only things that I could relate to symphonically (and perhaps structurally). Many of the other pianistic greats before Chopin had also been fantastic composers in other realms, Mozart and Beethoven coming mostly to mind here, but even Schubert, who was born 23 years before Chopin, produced a fantastic output of symphonic and pianistic repertoire (though interestingly, not a single piano concerto to be found among his works). Chopin followed the structural example of concertos in the style of Jan Ladislav Dussek and Johann Nepomuk Hummel, with which he was familiar. He was interested in neither the Beethoven-style dialogue between orchestra and soloist, nor in a Weber-style interweaving of voices. One could see how a young (admittedly genius and very accomplished, but still young) Chopin may look to familiar examples for inspiration or direction, while still finding his own style. The classical crispness of this piece to me is very strong. It has the polish and properness of something that would have come from earlier than 1830. For reference, Liszt’s first piano concerto, while not premiering for another almost three decades, originates from the time this piece premiered, with the sketches dating from 1830. The works are so incredibly different in so many ways, but not just because of the time periods. Liszt was born only a year after Chopin, but their styles do tend to differ. Chopin’s piece sounds far more Classical-period to me, while Liszt’s hardly does. Chopin’s first movement here is also about as long as Liszt’s entire first concerto, but Chopin’s last two movements are each about half that length, although they feel much shorter somehow. Just listening to this piece a few nights ago, I got to realizing how much room for interpretation and emotion there is in this piece, contrary to an old recording I had gotten quite used to that made the level of excitement or expression seem much drier. Zimerman, as always with everything he touches, and especially Chopin, shows amazing balance and clarity and control. It’s superb. Wunder was also exquisite, and the delicacy and expression and emotion makes me think of Chopin nocturnes at times, etudes at others, with the added bang of having an orchestral backing. I really must extol Zimerman’s performance of this piece (also conducting it, to boot!). I listened to a different recording of this concerto because it was the one I had and never questioned it, but this…. This recording made me see the piece in an entirely different light. It’s rich and expressive and I was actually… quite shocked, in only the best of ways. I would tend to argue here then, that the orchestra’s role is that of accentuating, of emphasizing the piano, while not taking any of the spotlight. The orchestra introduces the themes for the first movement, and as is typical in many concertos, the piano doesn’t enter for a while, but when it does, it picks up those already established themes. From there, it’s very Chopinesque Romantic-era piano things, again with the added beauty of the richness of the orchestra. Wikipedia makes note that Chopin’s focus may here be more on the rich and interesting harmonies that show such complexity in contrast with a simple orchestral accompaniment. Whatever you decide to believe, the result is truly beautiful. I spoke with a friend about the concert that evening (afterward, when I was at home, only realizing we were both there after we’d both left), and he said he was nearly in tears during the performance of the first. It was gorgeous, truly rich, sumptuous, warm, cozy perfectly executed music, but it doesn’t move me that way. After much preparation for attending the NSO season opener concert with Mahler’s ninth on the program, I was excited to attend, and when those first notes rang out from the first movement, that made me weep. Chopin did not. That’s not a criticism; it’s just a different emotional response. The first movement is satisfying harmonically, texturally, and virtuosically. The second is stunningly lyrical and beautiful, and the third is fun and quite playful. Those three separate emotions, delineated so perfectly, and with such really beautiful writing for the piano makes for a piece that is hard not to enjoy. Now, I must say (as above) I have only recently begun to enjoy Zimerman’s performance here, and it is likely he will change this for me, but… despite the beauty and satisfying pleasure of such a splendid piece, this is just not a piece I turn to very often at all to take a listen to when I’m cooking or cleaning or on the bus or going for a walk or even at my desk at work. I don’t dislike it, but it is decidedly not a piece that I keep coming back to begging for more. Of concerti, Sibelius’ violin concerto comes to mind as one I could listen to on repeat for ages (Nigel Kennedy with Rattle and CBSO was the first recording I really fell in love with for that piece), and for piano concertos, it’s Rachmaninoff, the Grieg, Sigismond Thalberg, Scriabin, Dohnanyi, and more recently the Schoenberg (how amazing!). This piece has a place in my heart as one of my early discoveries in the world of classical music, and it is truly great, but it is by no means a tear jerker. It is, however, a must listen, as is anything, really, written by Chopin and performed by Zimerman. Cheers to two great Poles.